Is there a way to add password to protect PDF file with A-PDF Content Splitter? I enjoy using A-PDF Content Splitter to split invoices into smaller PDF files based on the text information. But for the needs of my future work, I want to set permissions to protect my PDF. Is it possible? And what should I do? Thanks for your appreciation. I am so happy that A-PDF Content Splitter helps you in your work. As you know, A-PDF Content Splitter can separate PDF files by keywords. It can locate the position based on the rules you set. And then extract and compare the text, lastly generates series of small files. When you set the rules, you can customize your output PDF files. In other words, you can add password in this moment. The following tutorial will help you understand better. You are allowed to add one or more PDF files. Just click the button and add what you need. If you make a mistake, you can remove the PDF file. You can select the rules you set before or import new rule. Also you can add you own rule. Two type tags are provided for you. You can add split tag or macro tag according to your requirement. 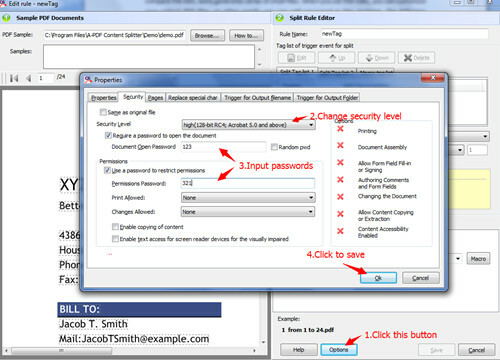 In this section, you are allowed to add open password and permissions password to protect your PDF files. Besides, you can change the properties; select the page to split and so on. Step 4: select the output folder and click the button “Split all” to save.